What can we learn from the gay rights struggle of the 1970s? Don’t give up the fight! What have we learned in the past 33 years? Apparently not much in the brotherly love category. Far too many of us are easily manipulated by hatred and fear ginned up by right-wingers and Christian zealots. Last night I watched Milk, the 2008 movie about activist Harvey Milk (above), the first openly gay man to hold a major elected office, a position on the County Board of Supervisors. Watching an inspiring movie like this one two years after the will-it-get-an-Oscar? hoopla allows the viewer to concentrate on the story and the multiple parallels between 1978 and 2010. 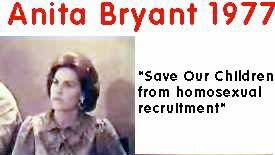 Being a woman … ahem… of a certain age, I was a happenin’ young 20-something in 1978 and remember well the multiple movements of the 1960s and 1970s, but I had forgotten Anita Bryant’s anti-homosexual crusade. Running parallel with Bryant’s anti-gay efforts were Milk’s gay rights efforts in San Francisco. The movie depicts Milk debating and tirelessly fighting a California legislator who backs Proposition 6, a measure that would have barred gays from teaching in California schools and would allow schools to fire gay teachers. The parallels between the anti-gay fervor of the 1970s and the anti-immigrant and anti-Muslim fervor being promoted today by Republicans and Tea Baggers were striking. Fear, religiosity, and preservation of family and “American values” were used to paint gays as outsiders– just as these right-wing strategies are used today to paint immigrants and Muslims as dangerous outsiders and justify discrimination. California’s Prop 6 (which eventually failed) even had witch-hunt tactics like SB1070. One of the proponents of Prop 6 says that they have “procedures to identify who’s a homosexual”. His statement so reminded me of Governor Jan Brewer’s reassurances that Arizona’s law enforcement officials can spot illegal immigrants but then she couldn’t say exactly how. Milk’s speeches toward the end of the movie– and the end of his life, since he was assassinated in 1978– were stirring. “I want to recruit you to further the fight to preserve democracy,” he says. 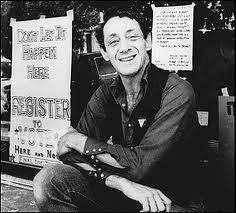 What can we learn from Harvey Milk? The struggle continues. Keep fighting. Vote! 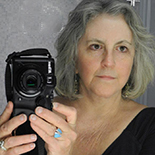 This entry was posted on September 8, 2010 by Pamela Powers Hannley in 2010 elections, Arizona, equality, Immigration, Republicans, SB 1070.